“I do actually care,” St-Pierre said of his preference. “Carlos Condit is a very nice guy. I never trained with him, but I have trained in Albuquerque along with some of his teammates. I like him a lot. But, the reason why I wish Nick Diaz to win this fight is that I want to fight Nick Diaz. I don’t want to fight Carlos Condit. I want to fight Nick Diaz. 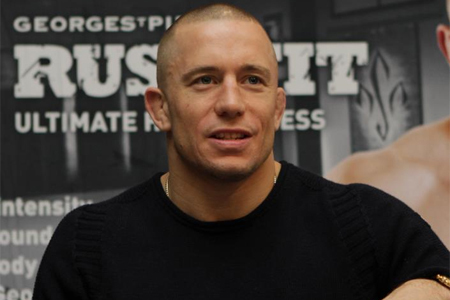 GSP is currently on the mend from a December knee operation. While the injury is the worst he’s suffered during his illustrious career, the 30-year-old promised to return at “110 percent” before the year’s out. “Hard training will be in July and fighting again, for the timing to get back, I would say in November. I can come back in November,” St-Pierre stated. Based on his timetable to resume his reign, it would mean either Diaz or Condit would have to wait nine months to try and unify the 170-pound crown. If that’s the case, the interim champ might look to make one title defense before St-Pierre comes back. Depending upon how is recovery goes and the timing of the interim situation, it’s also possible the UFC could have St-Pierre take a “tune-up” fight to ease his way back into the Octagon. UFC 143 takes place November 4th inside Mandalay Bay Events Center in Las Vegas, Nevada. St-Pierre will be sitting front and center to scout the action.